Please feel free to access our websites and blogs for the latest information on health topics for your child, I hope you enjoy exploring. Healthykids is a free site aimed at providing support and information to parents with children under the age of 16 years. I also live by example in that I run every day of my life and will be closing in soon on doing my 100th marathon. Dr. Nieman first book Moving Forward, is now on sale. The book is intended for those who want to be more consistent with healthy habits. It is also a book about enduring the marathon of daily expectations. The book is intended for those who are keen on overcoming obstacles. Being a marathon runner, and someone who continues to run every day since Dec 16, 2012, Dr. Nieman can speak from experience. 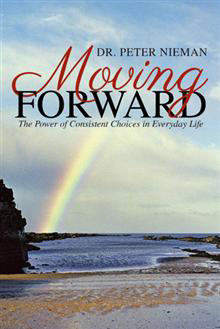 Dr. Nieman book Moving Forward is now on sale here. Perhaps you feel stuck in a rut. You may be lacking inner peace. Or maybe you cannot let go of a painful past that imprisons you daily. You may be completely unsure of your purpose. You may feel unloved. You may feel as if disappointments will never stop devouring you. Perhaps your mind used to be filled with curiosity, but now it lacks vigor. Others may honor you, but you do not honor yourself. You are stuck. Moving forward seems so unlikely. Or … maybe you have moved forward but feel there is more to life. What I am about to share comes from a place of humility. I did not decide to write this book to impress anyone with how much I know as a doctor, a part-time medical journalist, or an endurance athlete. My motive is to help you and inspire you to live your life in such a way that when you cross the finish line one day, you can look back and say, “I served well and reached my purpose.” It has been said that there are two important days in anyone’s life: the day you were born and the day you figure out why. I wrote this book to encourage you on the journey we all share—the path forward. We all get to choose how we want to move forward. Moving forward one step at a time is indeed a process, a journey, and it takes a lifetime. Sometimes this journey will be marked by detours. Be patient and trust that, as the poem “Desiderata” reminds us, the universe will unfold as it should. Many of the ideas in this book will resonate almost immediately; other will make perfect sense only later—perhaps after a sudden setback or a deep disappointment. As the Zen saying goes, when the student is ready, the teacher arrives. That has been very true in my own life and in the lives of many others who have experienced enlightenment episodes, one after another. This shedding of new light can also be described as an inner knowing, a quantum moment, a major, unexpected shift. I have intentionally kept my writing simple; I’ve filled these words with a deep sense of humility, and I deliver these thoughts with compassion. I can share only what I have learned over the years through adversity. Most of these afflictions were overcome because I learned what it means to move forward. Looking back, I can confidently say that those lessons—the roses and the thorns—all arrived at the perfect time and that there are no accidents. During the darkest adversities this was hard to see. But every person I met and every situation I experienced taught me something. I had the choice to learn and get better or to ignore events as random coincidences. I chose to grow from adversity. The theme of this book is that we all get to choose how we want to move forward. It requires an alive and open heart. They radiate inner peace, contentment, serenity, and tranquility in the midst of life’s many adversities. They are aware that a highly energized life leads to being more productive. This productivity is not just for selfish reasons but for sharing with those in need. The ripple of moving forward touches others. When we give ourselves to other, we experience healing. They see daily discipline not as a form of self-inflicted masochistic suffering but as a pathway to a place of purpose and service. It’s a commitment to living one’s destiny in abundance—not in lack. They have discovered that consistency in moving forward creates a higher level of vitality and inner harmony. A commitment to daily actions over decades not only teaches us about a compound effect but also helps us to stay content, because we know our purpose. They understand that it is possible to move forward alone but that in the end it is our associations that change everything. The company we keep determines who we become. Associations are roots that influence the fruits. They enjoy the bliss of an inner, serene knowing that faith is simply a form of trusting in the wisdom of a divine intelligence. This higher power cannot be touched and can only be known fully when we love others as we love ourselves. They are motivated by love, kindness, and compassion. They understand there is a simple eternal truth that has been taught for centuries. It is all about how to live life purposefully: don’t do bad things; always do good things. You may notice I listed eight qualities of people who choose to move forward. Why eight? The number symbolizes infinity. There is an infinite number of ways to move forward, but in the end we get to choose the way that resonates best with who we are. We were made by our source for a purpose, and to find that place of calling is pure joy and peace. It is with a deep sense of gratitude that I get to honor you by sharing these suggestions. May you receive some benefits from these words, may a new mind transform you, and may these pages inspire you to move forward all the days of your life. We are about to embark together on a journey I have called Moving Forward. Copyright © 2019 Peter Nieman, All rights Reserved.